I'm trying to create a custom report type linking two standard objects together -- Opportunity as the primary and Account as the child. I am able to create everything fine, but when I actually use the report type, no Account fields are visible. I'm a system admin, so there shouldn't be any permission problems. Any ideas where I'm going wrong? 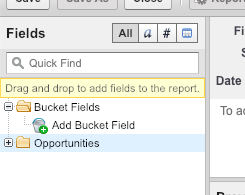 You've gotta edit the report type layout to include fields from the Account. Here's a Salesforce Help article detailing how to do so; it'll take you 15 minutes to do this if you go thru steps 1 - 9.